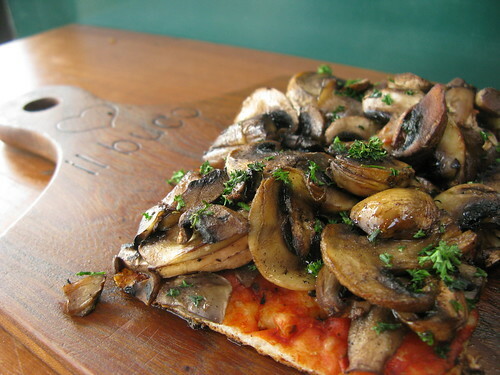 A funghi pizza from Il Buco in Auckland! CC image via flickr user moirabot. i-am-fruit-bat: Cherry chocolate banana ice cream after a gorgeous run along the lake shore. Posted: 12/29/12 at 8:06 am. Filed under: Saturday Garbage Plate. Photos courtesy of Great Plains SPCA. Mr. Tucker brings to mind a distinguished old newscaster – Walter Cronkite, perhaps, or Tom Brokaw – a little grizzled and scrappy, but wise and distinguished and someone with whom you’d definitely want to hang if given the chance. What has this little guy seen in his nine years, some of which were spent walking the mean streets of OP? Only Mr. Tucker can say. Unfortunately, he’s been living in the Cat Condo at Great Plains SPCA for nearly a year now, patiently waiting for his forever home. His eyesight isn’t what it used to be, you see, and so he doesn’t make the best first impression with potential adopters. All these strangers scare him! But you know what they say about strangers: they’re just friends waiting to happen. If you think this applies to you, go meet your new friend Mr. Tucker today. A cage is a lonely place to be, especially during the holidays. Hi my name is Mr. Tucker, but we don’t have to be so formal with each other. You can just call me Tuck. And what should I call you? Oh, that’s a good name too! Let me tell you a bit about me, then you come down and we’ll get together in person and see what develops. I’m nine years old and was abandoned in Overland Park. A nice man found me and gave me food and water and took care of me until he could bring me to Great Plains SPCA. The nice people here took me in and now I’m looking for my second chance at happiness. Unfortunately one of the things that comes with age in people, and less often in cats, is cataracts. Hmmm . . . wonder if they named those after us felines? Anyway, I can’t see very well, so I can’t tell that faces coming to my kennel are friendly ones of people who are interested in adopting me. I also can’t see that the hands reaching out are soft to give me gentle petting. I’m very wary of strangers because I’m afraid without being unable to see them or size them up for myself. So I’ve been here a while waiting for my forever family, as I’m not as outgoing and approachable as some others here. I’m also a little grumpy being in a cage most of the day. You wouldn’t like that either, would you? In a home, I’m a whole different person. I lived with a foster family for a while and in their home, I was a very snuggly kitty. I loved the husband in the family and hung out with him a lot. I slept with him, watched TV with him and would let him pet me for a long time. We were buds! It may be that I like men better than women. If you’re a guy, why don’t you come down here and we can do some male bonding. If you come visit, bring Whisker Lickens treats and we’ll probably do fine. Cats rely a lot on their sense of smell and if I smell my favorite treats, I’m usually thinking good thoughts and how much I’d like to meet the person who brought them, and will even let them pet me, but just a little. The doctors checked me out and my eyes do appear to see, just not well enough to quickly make out the objects and adjust. I’d need a quieter and less lively home where things are usually in the same spot and the routine is predictable, so I can navigate easily with my vision. Needing to quickly dodge around anything to get out of the way is tough for me, so I’d need a home without other cats, dogs or rambunctious children. I love kids, but toddlers often get excited easily having fun, so might streak through a room at warp speed or throw toys around or leave them in my path. That’s more of a challenge than I’d like. I’m looking for sort of a retirement home, where things are quiet, the cushions in the sunny windows are fluffy, and where there are soft toys and catnip to entertain me. A house more like a library than a carnival, if you know what I mean. I am hoping with all my heart that you’d be a purr-fect match for me and that you’re willing to come and meet me and see if we might work out together. I’d be so grateful if you chose me and made a home for me. I’m a good little guy and deserve a new chance at happiness. Don’t we all? If you click through, you’ll find that Mr. Tucker’s Petfinder listing is pretty sparse; I pulled the above info off his Petango listing on the Great Plains SPCA website, but couldn’t figure out how to link to the listing itself. Just go to www.greatplainsspca.org/adoptions-and-services/adoptions/view_adoptable_pets/ and scroll down until you find him! Posted: 12/28/12 at 12:37 pm. Filed under: Find-a-Friend Friday. 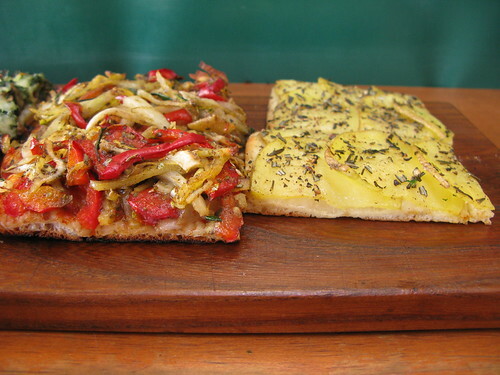 Vegan pizza from Il Buco in Auckland, New Zealand! Posted: 12/22/12 at 8:10 am. Filed under: Saturday Garbage Plate. Bo & Scrappy, the cutest boys on the block. Photos courtesy of Midwest Pug Rescue. Like so many of the animals on Petfinder, brothers Bo and Scrappy found themselves homeless when their elderly humans were no longer able to care for them. These guys love one another and need to find a new home together, which makes their prospects that much more dismal – most folks are only interested in adopting one dog at a time. If you’re thinking about adopting, please consider a bonded pair. Not only do you save twice the animals, you also spare them the pain of lifelong friendship severed. No more goodbyes, only hellos. Warm, wet, sloppy hellos! Bo and Scrappy are 4 and 7 year old brothers. Their elderly owners had to move into assisted living so the boys need a new home. They are both as precious as can be. Bo is a small apricot and Scrappy is a large light fawn pug. They are getting neutered/shots and dentals so they will be good as new soon. They are pretty attached so we would really like to keep them together. Posted: 12/21/12 at 11:20 am. Filed under: Find-a-Friend Friday. 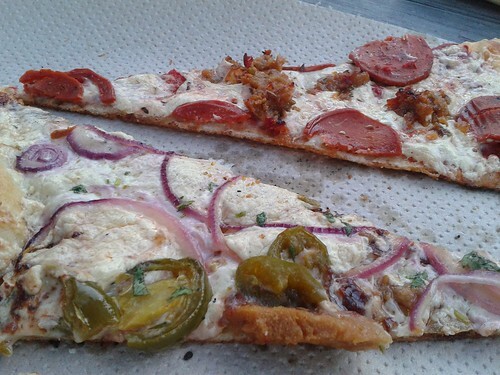 Vegan slices from Hoboken Pie in Austin, Texas. I WILL TAKE THEM ALL PLEASE. CC image via flickr user mollyjade. Posted: 12/15/12 at 4:45 pm. Filed under: Saturday Garbage Plate.